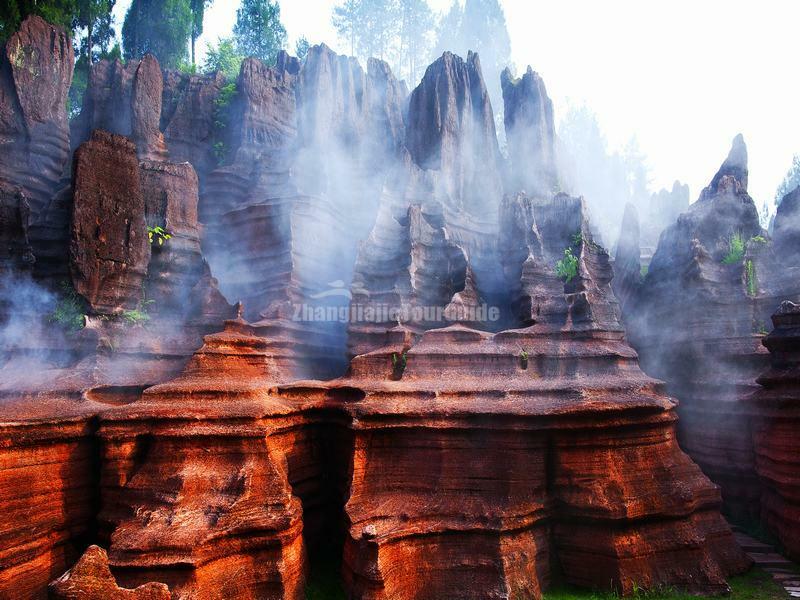 The Red Stone Forest National Geopark, also know as Guzhang Mountain, is located in Jietong and Duanlong Township in Guzhang County, Xiangxi Tujia and Miao Autonomous Prefecture, South Central China's Hunan Province. Covering an area of 20 kilometers square, its opposite bank of the Yuoshui River is the famous Furong Town. The park was rated as AAAA scenic area of China by the Ministry of Culture and Tourism of PRC in 2012. 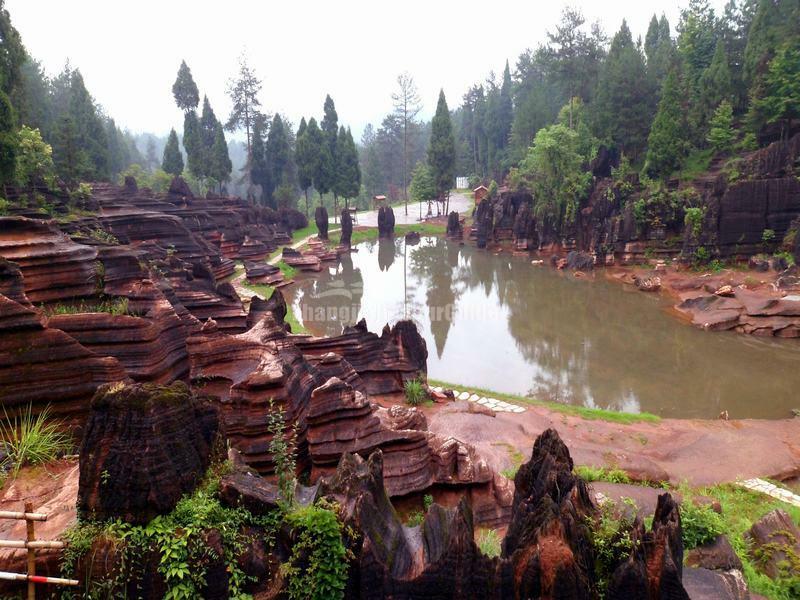 The Red Stone Forest National Geopark features the natural red stone forest which was formed in the Ordovician Period (500 million to 425 million years ago). In the park, ancient animal fossils can be seen anywhere with various lifelike. 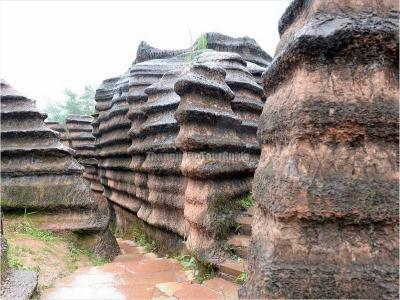 Among of them belongs to the Corner Stone, also called "the Stone Pagoda" or "Chinese Corner Stone" that is one of the standard fossils of dividing stratiraphic age, and it has important value of scientific researching and collection. The park outstands with its deep caves and miles of red carbonate-rock stones whose color changes with weather and temperature. In summer with hot sun, its color turns into fiery red. During cloudy day, it would be maroon and purple. However in heavy rainy day, it is black. It is also of high value in geological research, aesthetic appreciation, and tourism, with karst typographies,canyons, caves, lakes and waterfalls all gathering here. Folk customs and arts such as original ecological dances "Maogusi" and "hand-waving" are included in the intangible cultural heritage of state level, further adding luster to the park. 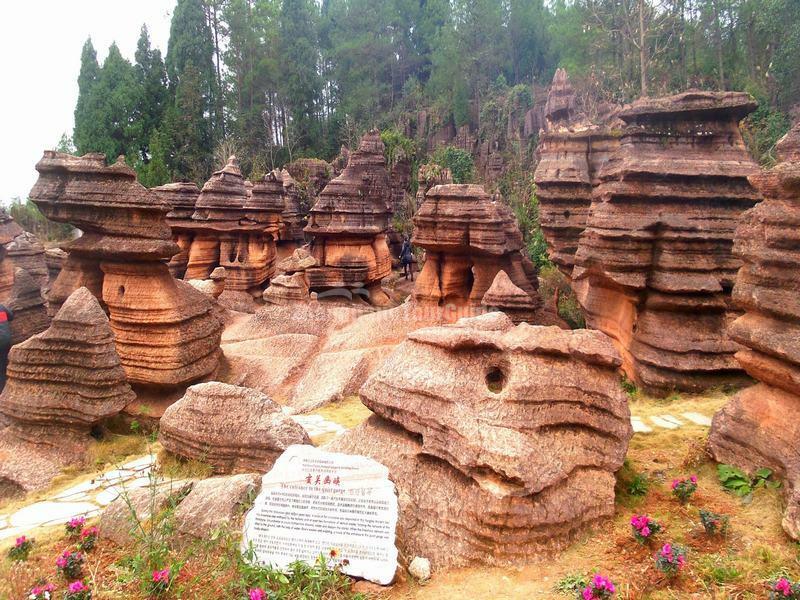 The red stone park is 82 km away from Zhangjiajie Hehua International Airport, and 27km away from the Guzhang Exit of Zhangjiajie-Huayuan Highway, between Zhangjiajie City and Fenghuang Ancient City. 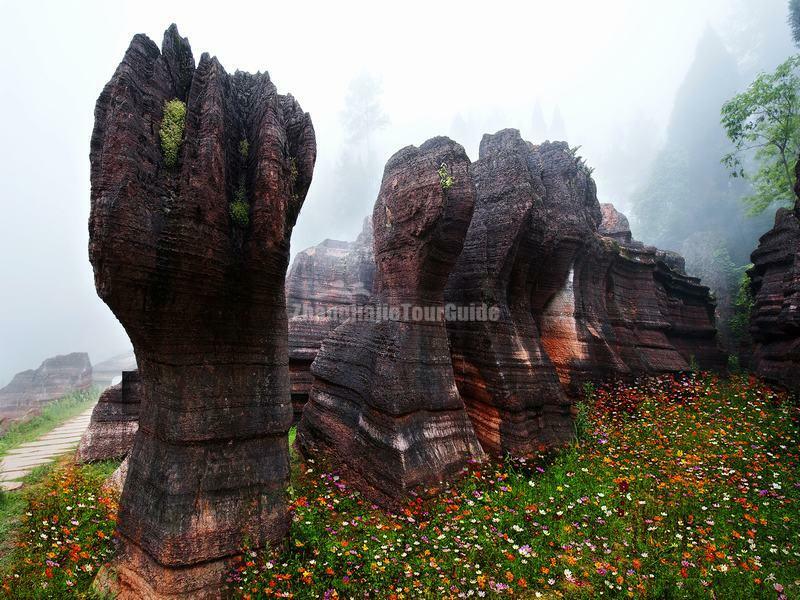 For the foreign travelers who are going to visit the read stone park, we suggest taking Zhangjiajie as your starting point. It takes about 2-3 hours to drive to the park. 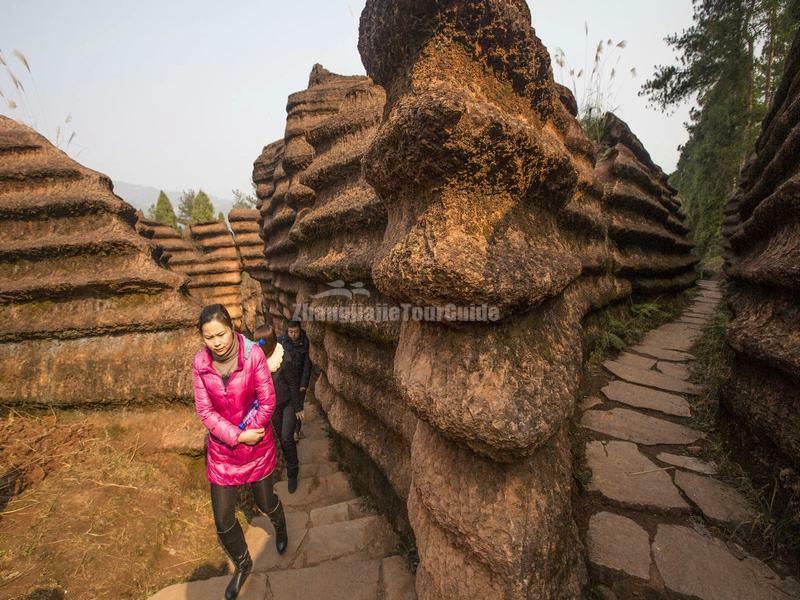 If you start from Zhangjiajie at 8 AM or 9 AM, you have sufficient time to visit the park and Furong Town and return Zhangjiajie or continue your trip to Fenghuang Ancient City.